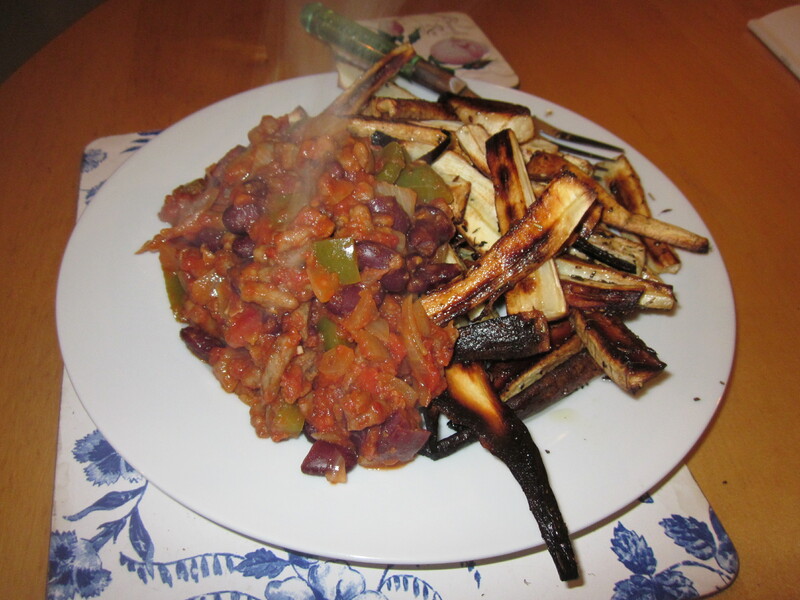 Steamy – vegan chilli with parsnip chips! On Saturday, I attended a course run by Animal Aid, to learn to be a vegetarian cookery demonstrator for Animal Aid. The animal rights campaign group have a network of speakers and cookery demonstrators who work with schools to explain the vegetarian and vegan issues. It was great to meet other veggies and vegans from Sheffield. I was made very welcome at the session at Sharrow Old Junior School, and I even learned the secret of making coffee with soya milk, without it curdling. We had some great discussions about why we stopped eating meat, and the arguments for becoming vegan: animal welfare; distress and pain of animal slaughter; environmental and health reasons. I decided to become a vegetarian in 1990, when I was thirteen, after watching a programme about factory farming. I’ve always loved animals. As a child, I loved meat, but I decided to give it up, and even in the early 90s, there were lots of meat substitutes such as Linda McCartney sausages! I still remember the argument I had with my mum while walking around Safeways (that dates it – who remembers Safeways?) as she thought that I shouldn’t give up fish while I was a growing girl. I loved fish too, but when I went to university, I decided that I needed to do this whole vegetarian thing properly and I never really missed eating fish at all. Two years ago, I realised at last that the dairy and egg industries are just as cruel as the meat industry. I became vegan for lent, and I decided that I’d carry on being vegan. It’s not always easy – there are so many milk and egg derivatives hiding in products, and eating out can be a bit of a minefield. However, my diet is a lot more healthy now I’m not eating all that fatty cheese – and I feel like I’m making a difference! Turning vegetarian as a teenager turned me into a keen cook, and I love to cook for friends – so I’m keen to show young people how easy it is to cook vegetarian and vegan food. I’ve only ever cooked meat about twice in my life, and I didn’t enjoy it! Our cookery teacher Lizzy, also runs her own vegetarian cookery school, ourlizzy.com. She was very friendly and led the practical sessions on making a vegan chilli and a sausage and bean casserole. We ate the chilli for lunch – it was delicious! I discovered that talking and cooking at the same time isn’t as easy as I’d thought! There’s a lot we’ll have remember to explain when we’re volunteering in schools – talking through the ingredients and how to cook them; the importance of a balanced diet; the wide range of veggie products available in the shops; the reasons people become vegetarian and vegan, and the health benefits. We took the leftovers home with us. Check out more of Animal Aid’s recipes here. Afrobeats sing in the firelight! But I wasn’t going home yet – I was going to Hagglers Corner, to a one-day charity festival for Mackenzie’s Miracle – fundraising for a little girl battling the childhood cancer neuroblastoma. The weather was fairly cool, but dry, with bursts of sunshine – a relief to everyone after the non-stop rain on Friday. The arts centre has an open courtyard that’s ideal for events, with gazebos in case of showers. There’s a cafe-bar, and a beautiful beamed room upstairs which is a great music venue, as long as tall people don’t jump up and down – as some of the beams are quite low! Almost as soon as I arrived, I joined in with a Kuduru dance session, led by my friend Angelina, who runs the Mulembas D’Africa dance school. Angelina had also been roped into being the announcer for each act and she was doing a great job. The Boomshanka Bellydancers also did a great job, and there was some graceful dancing from Pansy Cheung. The bands were a great selection of Sheffield talent, especially in the area of great vocalists. 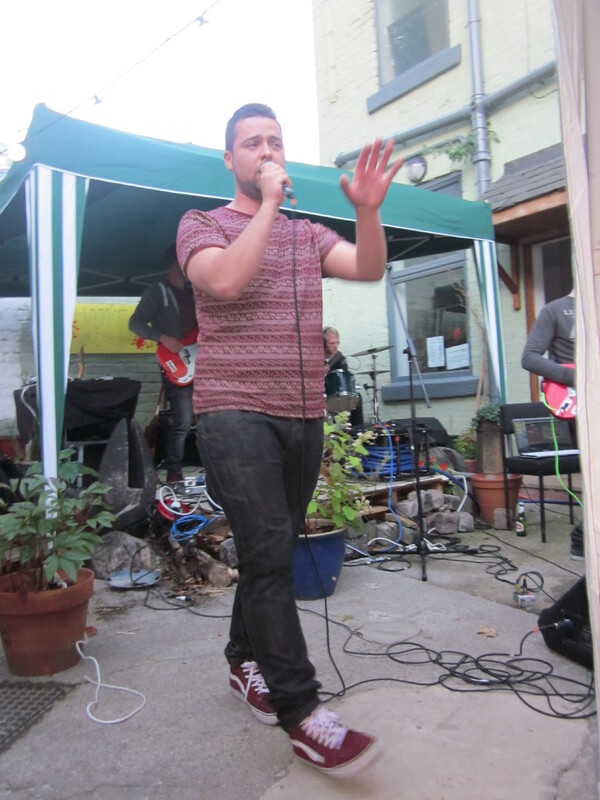 Bongo & the Souljar gave us soulful songs with vocals reminiscent of Paul Weller. Stop Drop Robot combined great singing, heavy guitars and electronica. As the evening grew dark and people started dancing, Unscene were a big hit with their acoustic reggae vibes – vocalist Jammy really blew the audience away in particular. As the firelight in the courtyard started to flicker, Afrobeats provided a magic moment with their acapella African singing and dancing. Audrey Horne features Allstar Revolution vocalist Diddly Dee, tonight, giving Karen O a good run for her money, with shoegazy guitars and epic soundscapes. Definitely a band to watch. As it got later, the music moved indoors, but there were still people in the courtyard, chatting around the open fire. The night brought lots of Sheffield creatives and music fans together and I met lots of great people, as well as catching up with old friends. The festival had a real family feeling and made me feel very proud of Sheffield. 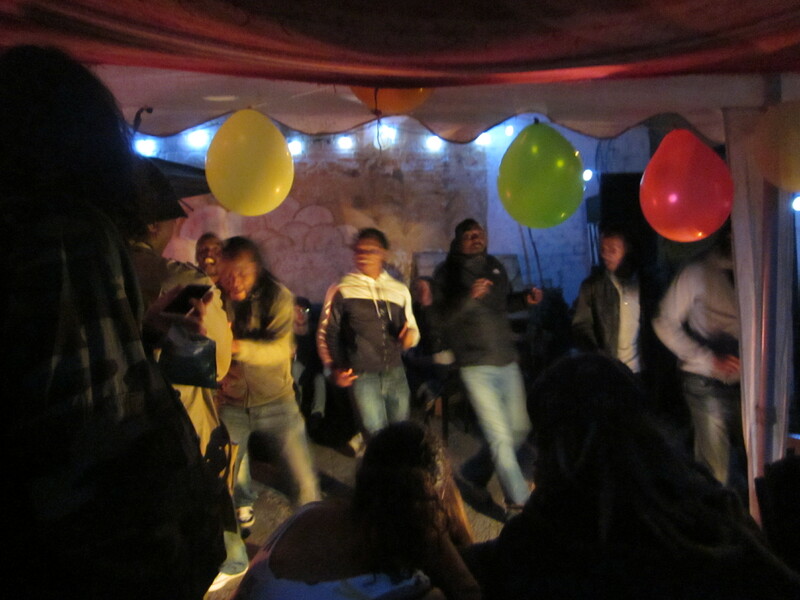 Later, there was reggae and D’n’B upstairs with a couple of great MCs. Playing late at night in the cafe was singer-songwriter Pro-verb, definitely one of the evening’s highlights. Combining rap, spoken word and insightful and funny lyrics, this young artist is set to go far. I had so much fun at this tiny festival. 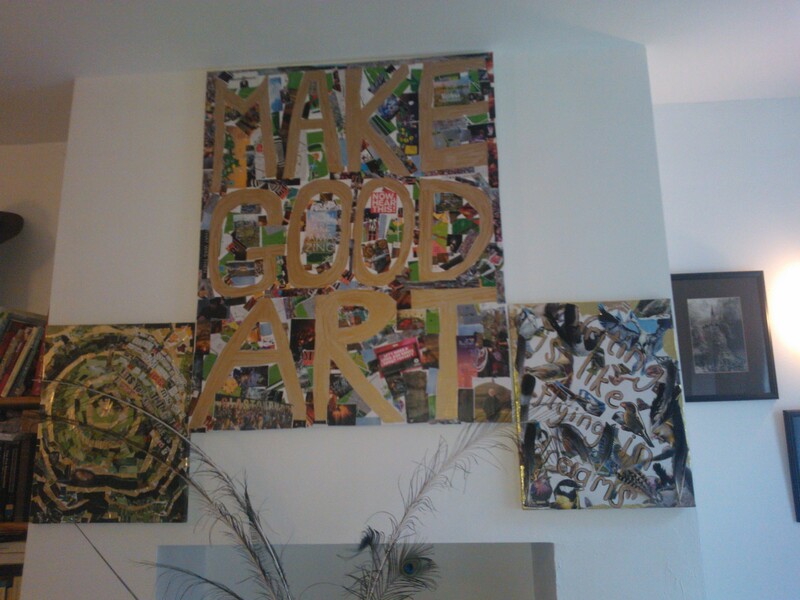 It was a big success and I hope that there’s another one before too long!